Bernard Stone - The death of Bernard Stone was recently announced. He ran the Turret Bookshop, initially on Kensington Church Street from the late 1950s and then in Covent Garden in the 70s, which acted as a focus for writers to meet each other, and for readings and launch parties. The free flow of wine provided by the host ensured a constant flow of bohemian literati, such as Michael Horowitz, Alan Brownjohn, Christopher Logue, Lawrence Durrell, Sillitoe and Sir John Waller amongst others. Poetry was the house-speciality and to many of its clientele, the ambience was more that of a club than a business. Stone was also a writer, having written four children's books, and a publisher. Stone was unique in being a bookdealer who became an integral part of the literary world. Arthur Miller - aged 89. Cancer and related health problems finally brought to an end the legend who was one of the 20th centuries greatest playwrights. Arthur Millar won the Pulitzer Award at the age of 33 in 1949 for Death of a Salesman and later took centre stage in the McCarthy anti-communist witch-hunts of the early 1950s, where he refused to name names and was held in contempt, which finding was overturned a couple of years later. The trials inspired The Crucible, set during the Salem trials of the 1690s which led to suspected witches being killed amid mass hysteria. As well as being revered by the American intelligencia, wedding Marilyn Munro catapulted him to the forefront of popular culture headlines for the duration of their 5 year marriage. Guillermo Cabrera Infante - aged 75. Guillermo Cabrera Infante, outspoken critic of Cuban leader Fidel Castro and one of the most original voices in modern Spanish-language literature, has died in London. Cabrera won the 1997 Miguel de Cervantes prize for literature, the most prestigious literary award in the Spanish-speaking world. He translated Joyce's Dubliners into Spanish in 1972 and wrote Holy Smoke, A View of Dawn in the Tropics (1965) and Infante's Inferno (1979). Hunter S Thompson - "Gonzo journalism" is Thompson's bequest to literature. In his Fear and Loathing the author' own life of drugs, drink and shooting is inextricably tied into the narrative, rejecting the role of the objective observer. Having honed his writing skills in Rolling Stone magazine in the 60s, Hunter went on to be one of America's foremost political commentators, using his barbed pen to great effect on presidents and lesser mortals on route. Though he played a major part in his final activity, by its nature, he was unable to report his own death by suicide. writer, born Louisville, Kentucky 18 July, 1937; died Woody Creek, Colorado, 20 February, 2005, apparently from a self-inflicted gunshot. 2005 will see World Book Day’s eighth year as the biggest annual celebration of books and reading in the UK and Ireland. Always keen to grow and to build upon previous year’s successes, World Book Day will have an exciting additional element for both children and adults - Spread the Word. To recommend a book to a friend - or even an enemy - click here to send an e-card to a friend or colleague. Edinburgh based crime writer Ian Rankin is setting up a student scholarship programme for would-be young authors. Students in the Communications and Media Department at Fife College will be eligible to apply for one of three awards. Donation for the scholarship has been made through the college's Adam Smith Foundation and principal of Fife College is reported as saying "We are delighted and honoured to receive the support of such a well known author who also has very personal ties to Fife". I moved to Peterborough from Brighton in the mid 1970’s for my first teaching post and am sorry to say, at that time, knew nothing of Peterborough or the area’s famous poet, John Clare. When I moved to Glinton a year later, I came across ‘Rambles with John Clare’ by Daniel Crowson, a 64 page book that guided the reader through local walks with maps, and bought it primarily as an aid to exploring the locality. These rambles, naturally enough considering the title, were accompanied by text about John Clare - his favourite spots and excerpts of his poetry, and I was hooked! John Clare’s works have had more publicity of late, especially when added to the national curriculum, but for those of you who still know little about this poet, what follows is based on books I have read over the years and is a brief introduction to John Clare and his works. 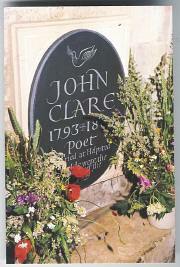 John Clare was born in Helpston(e), a Northamptonshire village, on the 13th July 1793. He was a twin, but sadly Bessy, his sister did not survive, and John the remaining twin was quite a weak child. John was born into a low stratum of society, his father being a farm labourer and amateur wrestler and his wife Anne (nee Stimpson) an uneducated woman from nearby Castor. Their home village consisted of 2 streets, fewer than 100 dwellings and held a population of approximately 250 mainly uneducated soil workers, who worked on land belonging to either Lord Fitzwilliam, The Trollope family or Christ College Cambridge. This was an era when the social structure was clear and accepted and villagers possessed mutual respect and trust for each other. The village of Helpston was and still is situated in a rural setting on the edge of the fens with its dykes and flat, bleak open spaces to one side and the woody Midlands on the other. John’s parents were keen for him to receive some education, which he commenced at the dame school in Helpston, then continued in the vestry of Glinton Church. Schooling however was only for a few months a year, as John needed to work at other times to help finance his education. Under the guidance of a master named Seaton John learnt to read, write and the rudiments of arithmetic. He had an enquiring mind and delighted in reading, developing both a love of learning in general and of poetry in particular. However the combination of his character alongside his affection for his studies change a shy, dreamy, reserved, nature loving child into quite a solitary, sensitive young man, who was a little different from his contemporaries. He rambled in the countryside for many hours alone, immersing himself in nature, often muttering to himself or chatting to the birds & bees. John’s sensitive character was apparent not only in his appreciation of nature, but also by his falling in love at an early age. Whilst at school he met Mary Joyce, the girl who was his school friend for years and later became his first love. Mary was the daughter of a comparatively wealthy farmer in Glinton. They sadly separated in 1816, possibly due to him feeling inadequate as a poor labourer. Their difference in circumstances would have been important but he appears to have remained haunted by his love for her thereafter, as illustrated in his writing - for example ‘I’ve wandered many a weary mile’ & ‘Lovely Mary, when we parted’ both written in 1841. (Mary by this time had died unmarried.) John later fell in love with and married Martha (Patty) Turner when she was 6 months pregnant with his child. They married in 1820, the same year his first book was published. When his schooling ceased, John took a variety of jobs including being a thresher, ploughboy, odd job man in the public house next door, gardener, lime-burner and eventually even joining the Northamptonshire Militia. Meanwhile, for his own amusement, he continued to write poetry. 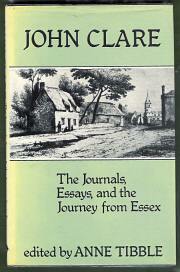 By 1819 John, encouraged by Edmund Drury who ran a Stamford Bookshop, thought he could have a future as a poet. 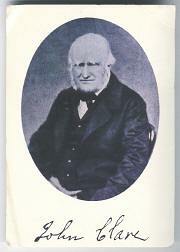 Drury had a cousin John Taylor, who was a publisher in London, and sent him some of John’s works. The eventual result was that John was given some financial assistance and in 1820 ‘Poems Descriptive of Rural Life & Scenery’ by ‘John Clare a Northamptonshire Peasant Poet’ was published. At this time there existed a boom in popularity of poetry, alongside a fashion for spontaneous genius, and John’s first book was well received, running into 4 editions in just over a year. Consequently John went to London and was treated with some celebrity by Taylor, his patrons & other Poets. However this superficial alliance did not fully breach the gulf between John and his new friends, despite the literary world being united in praise for the ‘Peasant Poet’, a patronising term in itself. He felt to some degree both an outsider from his London friends and also from his background community as his fame and studious literary bent took him away from the social class he had been born into. Also, despite having sponsorship and some receipts from his 1st book, John still had financial worries, exacerbated when, partly due the poetry boom being short lived, his second book ‘The Village Minstrel’ (published 1821), did not sell well. John and his growing family were becoming impoverished and he could not find farming/casual work locally due to his new status. John’s new friends had been concerned for his mental health right from the publication of his first book, anxious to see how hard he drove himself. The poor sales of The Village Minstrel and also of his next publication, the savagely edited ‘Shepherds Calendar’ (1827), alongside his increasing impoverishment and the squabbles between his publisher & his patrons, all added to his mental stress. Lord Fitzwilliam tried to help and offered John & his family the use of a cottage and some land to farm in the nearby village of Northborough. Although this helped some problems, it produced others as John by now did not want to leave Helpston with its security of familiar flowers, trees, bushes & birds. Nevertheless in 1832 he took the cottage and wrote ‘The Flitting’ in order to try & come to terms with his loss. In 1837, the mental illness that had been threatening for so long, having previously manifested itself in symptoms of depression and mild delusions, became unbearable, and Clare’s London friends arranged for him to be admitted to a private asylum in Epping. However during his 4 year stay here, although his physical health improved the anxiety that resulted from John being separated from his family and familiar surroundings and continuing financial worries, exacerbated his mental health problems. The delusions continued, and at times he thought he was a bigamist, locked up for the crime of having married both Mary & Patty. In 1841 he ‘escaped’ and the sad tale of his 4 day tramp home, and the delusions and trials he experienced along the way, has been recorded in ‘Journey from Essex’ taken from his journals. He returned to Northborough in poor health, and after a few months his wife who had grown scared both for him and of him appealed to a doctor to have him admitted to Northampton General Lunatic Asylum. Lord Fitzwilliam continued to patronise John, and arranged for him to be treated as a private patient, thus enabling him to have his own room, giving him some privacy to continue writing. 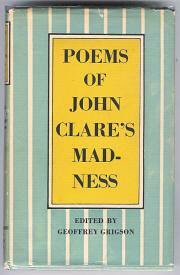 A good selection of the poems that John wrote between his first mental collapse and his death in 1864, can be found in ‘Poems of John Clare’s Madness’ edited by Geoffrey Grigson, 1949. In the early years that John was in this asylum, he was considered to be harmless, and was allowed to wander both in Northampton and the nearby countryside. However this must have been poor substitute to a man who relished wandering in his own locality. By standards of the day, John may well have been considered mad, but most probably if he had been born into today’s society his illness would not have required incarceration, medication would have allowed him to keep his freedom. However this was the 1800’s, and as his ‘bad’ periods increased and he became more unpredictable his freedom became increasingly curtailed. He continued writing poetry until 1861, after which both his mental and physical health declined and John Clare died on 20th of May in 1864. He was returned to Helpston for burial in St Botolph’s churchyard. John Clare was a combination of naturalist & poet, born into a class and era that enabled him to have a unique knowledge of and be affected by country sights & sounds at the most primitive level, and some of his writing can be seen as an emotional response to this. He adored and wrote about the country with a passion probably unequalled in English literature. Much of John’s poetry was a celebration; happy works concerning flowers, birds and creatures of the field, but inevitably some work emerged as a result of his own unpleasant experiences, such as his loss of Mary and from his incarceration. John wasn’t particularly viewed as a political poet, but political feelings are expressed in his poetry, especially exemplified in his strong opposition to the Acts of Enclosure which further impoverished the poor labourers and prohibited them from walking freely in the unrestricted countryside. ‘The Mores’ is a good example of John expressing his feelings on this. This short space cannot do justice to John Clare and his works - however if you wish to find out more I have listed some titles that may be of interest. These are not necessarily the best ones, but are of interest due to their time of publication or because they contain previously unpublished works. 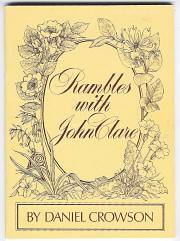 There are many John Clare related titles available, mainly on the second hand market, and some are to be found on the ibooknet site, or on our own site www.peakirkbooks.com. The idea of landscape ..
A newly discovered set of letters written by the poet Percy Bysshe Shelley are to go on sale at Christie's in June after being found in a trunk at a house in London. The letters are by Shelley and his friend and biographer Thomas Jefferson Hogg who were expelled from Oxford University in 1811 for writing a pamphlet about atheism. The eight letters were written to Ralph Wedgwood, a member of the famous pottery family, and shed light on Shelley's eventual emergence as a rebel poet and the theme of atheism in his work. Created in response to criticisms that the Booker Prize is only open to British and Commonwealth authors, the new £60,000 award is open to writers of all nationalities who write in English or are widely translated for "continued creativity, development and overall contribution to fiction on the world stage". Richard and Judy's 'How to get published....'. A competition on Channel 4's Richard and Judy show entitled 'How to get published' has been won by a 52 year old grandmother from Bournemouth, Christine Aziz, for her novel provisionally titled 'The Olive Readers', a portrait of a dystopian future and a love story of both courage and redemption. Sponsored by Pan Macmillan the show invited would-be authors to submit manuscripts, the winner being guaranteed a publishing contract. Somewhat overwhelmed by over 46,000 entries the judges eventually picked a shortlist of five, Christine Aziz winning the offered publishing contract and advance of £50,000 but in a surprise offer Pan Macmillan also gave each of the four runners-up the chance of a contract with a £20,000 advance.